Echocardiography is an essential tool for the modern-day cardiologist and routinely used in the diagnosis, management and follow-up of patients with suspected or known heart diseases. This best-selling book now returns in a fully revised new edition, once again providing cardiologists and cardiology/echocardiography trainees with a rapid reference, self-assessment question and answer guide to all aspects of echocardiography. 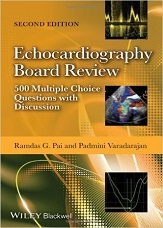 Containing 500 case-based questions, including clear explanations and discussions for every question,Echocardiography Board Review, 2nd Edition, is the perfect preparation guide for all those about to take the National Board of Echocardiography’s Board exam, including cardiology and echocardiography trainees and specialist physicians preparing for re-certification. Sonographers planning to take RDCS or RDMS certification examinations should find this book very helpful as well.